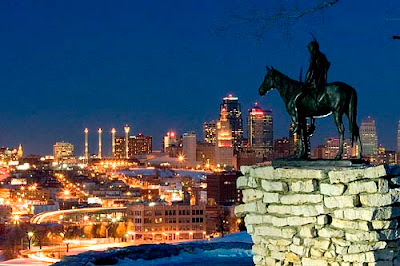 Post-Apocalypse: Kansas City, Here I Come!! This is bizarre...According to the Business Insider, my good ol' hometown of Kansas City is one of 12 Places To Go If The World Goes To Hell. No matter what happens to the USA, Kansas City will probably be okay. It's not at either one of the coasts, so you don't have to worry much about security or a foreign invasion or rising sea levels. It is surrounded by plenty of farmland (suitable for raising grain and livestock), and it's also at the intersection of several rail lines, so that if we experience an oil spike of unimaginable proportions, you'll still have access to transportation -- in fact, the city should thrive as a hub of activity. 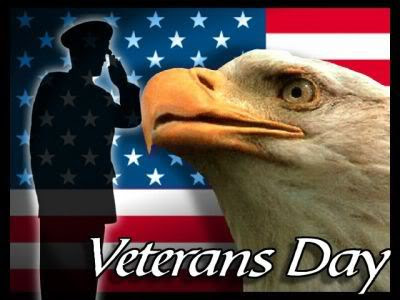 To all the veterans that visit today, thank you for your service and dedication to your country. As someone who has had family fight in every major conflict since the American Revolution (except Desert Storm), please know I appreciate your sacrifices! I'm especially thinking of my cousin, John, who is in Iraq today. Please stay safe! For anyone interested, here's a cool article about the Navajo Code Talkers from WWII. And, yes, indeed it has been a long time since I last posted, but I am doing fine. Lots going on, including my company moving across town. But I have a window and a nice, new, big, pretty desk, so I'm trying not to be fussy about the extra 20 minutes that was added to my commute.